Twenty years ago, author Arielle Ford created a system to manifest her soulmate using the timeless principles of the Law of Attraction: techniques, visualizations, rituals, and prayers to prepare her mind, body, spirit, and home for an amazing relationship with a man she had not yet met. Within six months, she was introduced to her beloved, Brian Hilliard—knowing instantly that he was "the one"—and a year later they married. Since then, tens of thousands of men and women around the world have used her "Soulmate Secret' to meet and marry the love of their lives. Now, Arielle's miraculous methods are paired with the romantic artwork of internationally acclaimed artist Manja Burton in this first of its kind transformational coloring book. Art therapists have long known that making art is a powerful and enjoyable tool for self-exploration and processing emotions. Inkspirations Love by Design contains simple yet specific exercises and information to create the frequency of love in your life. By coloring each page in this step-by-step guide with a clear intention, readers will mindfully and creatively raise their awareness to make their deepest desires for love come to fruition. Finding true love is possible for anyone, at any age, and this beautiful book will lead readers to open their hearts to the art of love. Are you ready to experience unimaginable love and manifest a soulmate who will appreciate and adore you? A life partner who will cherish you and be devoted to you? I didn't meet and marry my soulmate until I was forty-four, and I've learned a lot along the way about what does and doesn't work in the world of love and romance. To manifest my soulmate I used everything I had ever learned about the Law of Attraction, psychology, and spirituality. My intentions became crystal clear while I simultaneously cleared out the clutter in my house and in my heart. I learned and invented techniques, rituals, visualizations, and prayers that helped me prepare my body, mind, spirit, and home for an amazing relationship. And they worked. I met my husband, Brian, within months of beginning this process. He has exceeded all of my desires and expectations. He was, and is, everything I ever wished for. It's not your job to know how your soulmate is going to appear; you simply need to be ready, willing, and open to love. The Law of Attraction states that you will attract to you those things that match your state of being. The Universe mirrors back to us our beliefs about ourselves and the world. Believing that your soulmate is out there is critical to the preparation of manifestation. Finding true love is possible for anyone, at any age, if you are willing to prepare yourself on all levels to become a magnet for love. Inkspirations Love by Design is a transformational coloring book that provides you with a complete and proven process to manifest your soulmate—one that has worked for tens of thousands of people worldwide. The visual delight of these spectacular images by artist Manja Burton adds to the process by bringing your creative passion to the pages. By following the instructions, step-by-step, and mindfully coloring the drawings with whatever resonates in your heart, I know that you, too, will be reunited with your true love. PS: Please visit www.soulmatesecret.com/color to watch an instructional video on optimizing the Law of Attraction and this coloring book to manifest the love of your life. The Law of Attraction works by preparing you, in mind, body, and spirit, to manifest your deepest dreams and desires. What you think about comes about, and what you focus on blossoms and grows in your life. Coloring can help accelerate this process by taking you to a place that is free from outside distraction. By taking gel pen, marker, or pencil to paper, you are reaching your core self and entering the realm of endless possibility. Taking time out for peace and solitude each day is essential to your well-being. It is nourishment for the mind and soul and, when done along with Arielle Ford's exercises, will help you to set an intention for manifesting the love of your life. The drawings in this book offer a wide variety of styles and types. From intricate patterns in mindful mandalas, to flowing fields of flowers, and simple frames to accentuate your written thoughts and intentions, all are designed to enhance the exercises that will ready your mind and heart to receive love. ©2017 Arielle Ford. All rights reserved. 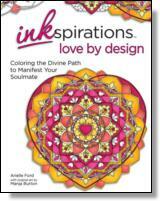 Reprinted from Inkspirations Love by Design: Coloring the Divine Path to Manifest Your Soulmate. No part of this publication may be reproduced, stored in a retrieval system or transmitted in any form or by any means, without the written permission of the publisher. Publisher: Health Communications, Inc., 3201 SW 15th Street, Deerfield Beach, FL 33442.